According to a recent article in Biology & Nature, human beings may be able to re-grow their own missing limbs. Scientists at Chemical & Engineering News are focusing their research efforts on limb regeneration. These scientists have discovered certain proteins and genes that play key roles in regenerating lost body parts. 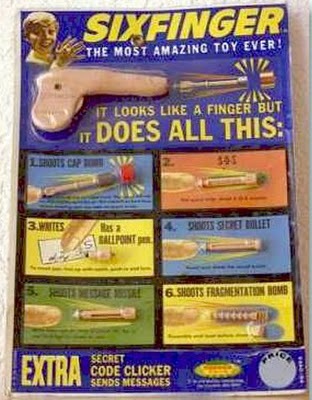 If I’m not mistaken, the process for growing an additional finger was figured out in the 1960’s by Topper Toy. When they developed Six Finger. This baby could shoot darts, bullets and write messages like a pen. I doubt these 21st Century scientists can beat that for under $2?